I’ve always dreamed about a Paris wedding styled shoot! The city of love, with it’s iconic architecture and charm, provides the ultimate background for photographs. 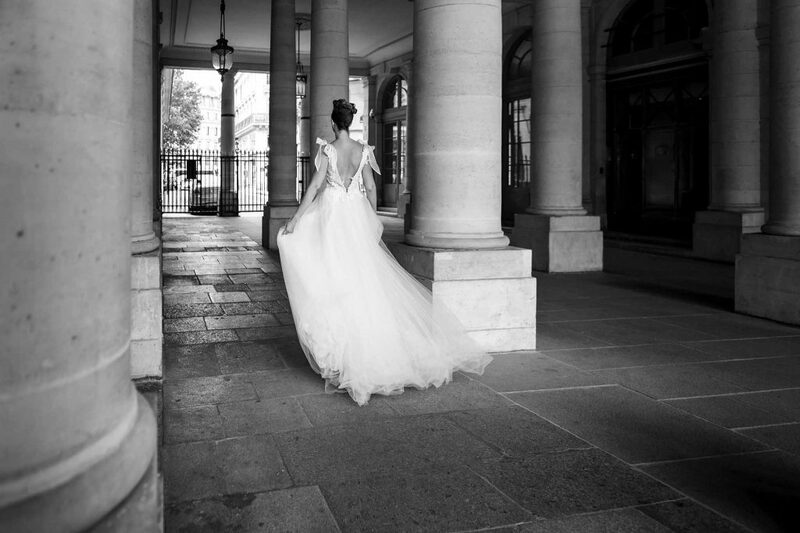 Some of the most renowned wedding dress designers have shot their collections on the streets of Paris. I was delighted to find out that I will be taking a signature dress from Kobus Dippenaar to Paris! Our Paris wedding styled shoot have taken us to the most sighed for locations. First of all – The Eiffel Tower. This landmark draws couples from around the world for their romantic photo shoots. Working closely with our Paris friends, we have been able to identify some incredible locations by the river banks, away from the crowd and with the perfect views of the tower. 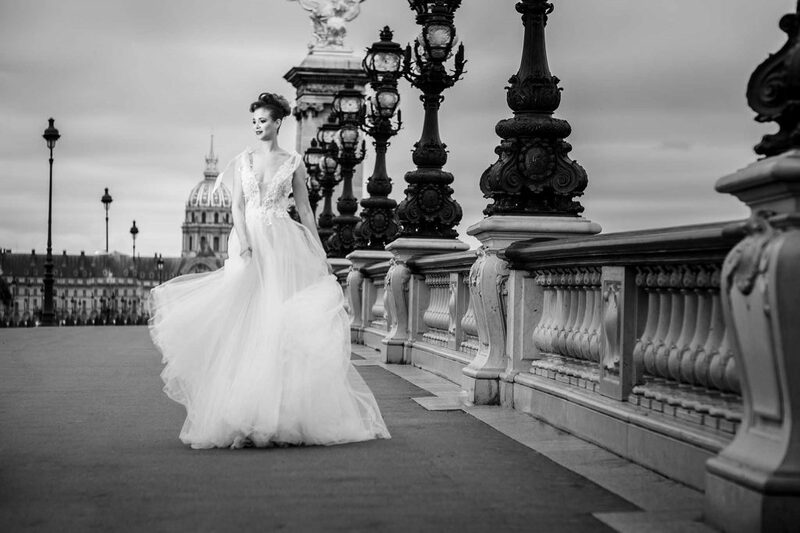 The model enjoyed strolling along the river in a designer gown, as we captured this iconic Paris wedding styled shoot. The second part of our shoot happened on the historic Alexander Bridge. This magnificent piece of architecture, crowned with lanterns and sculptures, stands out for everything glamorous and grand. Granite staircases provide ideal texture and background for photographs. We enjoyed capturing our elegant and stylish model in a historical setting. 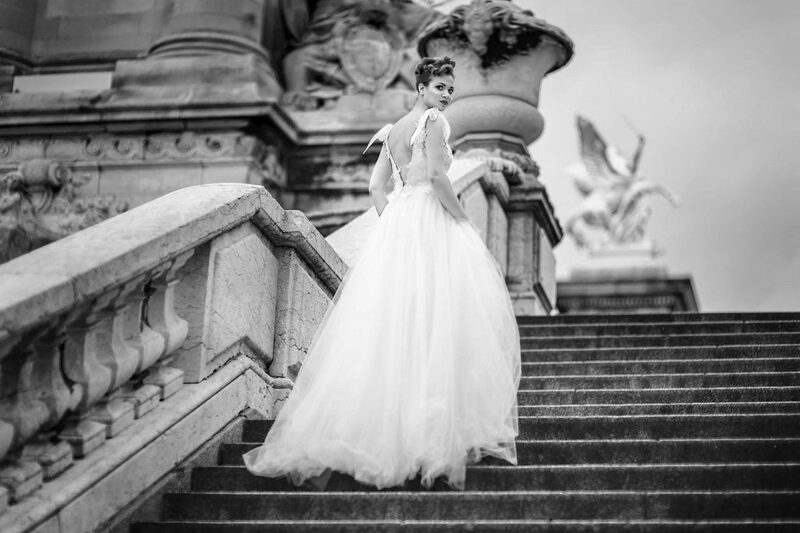 Gentle wind from the river lifted the dress perfectly, creating contrast between the rough granite of the balustrade and a soft layers of tulle. We all sighed as the model walked glamorously along the bridge! The last location of our Paris wedding styled shoot was the exclusive shopping arcade down town. We were looking for massive columns, where the model can walk by, creating a natural look. Faustine did a great job strolling amongst the ancient columns! The wedding dress opened up in the wind and all the countless layers of tulle came alive. We have captured some wonderful shots, full of motion and excitement. This Paris wedding styled shoot was a great adventure and a fulfilment of a dream. 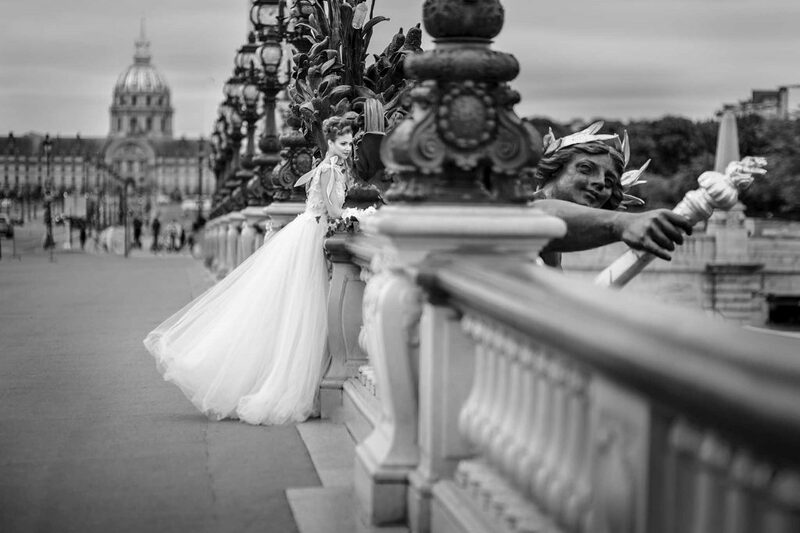 There is something eternal about shooting in the iconic architecture of Paris, where the romance is born. Those images will remind us the precious time we got to spend in the city of love!